This program offers a hands-on learning experience guided by daily lesson plans in the areas of Language Arts, Music and Movement, Science and Nature, Social Science, Math and Art. Learning Centers and Circle Time are used to teach days of the week, calendar math, alphabet, weather, and daily themes. Our Pre-K program introduces Kindergarten concepts to children in a fun, interactive learning environment. The curriculum includes Letter Recognition, Phonemic Awareness, Whole Language, and Writing, along with daily lesson plan topics of Music and Movement, Science and Nature, Social Science, Math and Art. Two Pre-K programs are available. The 3-day class is offered to children who are 4 years old by September 30. The 3-day classes are offered in both morning M/W/F (9:00-11:30) and afternoon T/W/Th (12:30-3:00) sessions. The 4-day (M/T/W/Th) class is intended for the older Pre-K students and those 5 year old children who are opting to wait another year before beginning Kindergarten. The 4-day program for older 4’s and 5’s is more independent learning periods, and requires more student focus. Students cover basic Pre-K topics more quickly and expand on the curricular goals. Students accepted into this class must be 5 years old by April 1,2019 or have approval from the Administrator. The 4-day class is offered in the morning from 9:00-11:30. 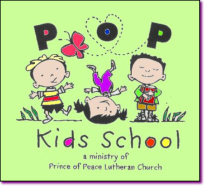 This program is a great way to introduce your child to a learning environment. Learning Centers let children choose the toys and topics they wish to explore. The children have a circle time where themes for the week are discussed, including weather, stories, and sharing. The children learn to socialize in a group setting, with emphasis on sharing, taking turns, and using words to express feelings. Bright Stars is the two day program for children who will be 2 1⁄2 by September 9th (offered on Monday/Wednesday or Tuesday/Thursday mornings). 2 1⁄2 through 5 years of age. It is the policy of POP Kids School that students three years and older must be toilet trained for admittance. ﻿Music:﻿ All preschool children will meet with our professionally trained music teacher. ﻿Author of the Month:﻿ Study of specific authors based on age appropriate levels. Hands-on Administrator: The Administrator spends many hours in the classroom to provide additional support to the children and staff. Chapel Time: Children meet in the sanctuary for songs and stories. Gym: On inclement days, our gym facilitates working on large motor skills. Spanish: Pre-K classes have Spanish time from a qualified Spanish teacher. ﻿Extended Day Program﻿: Students may sign -up to stay until 1:00 PM on selected days (additional charge for this activity). Drop Off: The children are escorted by the staff from the cars into school to start the day. Enrichment Programs: Special Programs such as the Cincinnati Museum Center are brought in to the school. Parent Auxiliary: Plans and organizes events such as Father/Child Pumpkin Night and Ice Cream Social. Continuing Education: Our teachers are required to take a minimum of 8 hours of Continuing Education Classes each year.